Each year the Officers and NCOs of the different Crown Forcers North America Regiments gather to prepare for the upcoming season. Interpretation of the drill manuals, safety procedures and “best practices” are gone over in class and on the drill field. The thinking is, if the officers and NCOs can get it right, they can pass this information on to the rest of their groups, making the experience better and safer for all. We would like to especially thank Ewan Wardle and Colin Sedgwick-Pinn for their enthusiastic instruction and support all weekend. While Saturday was reserved for those with rank, Sunday saw many of the rest in the regiments show for drill incorporating what we learned or re-learned on Saturday. Tonight, April 16, we held our annual Mess Dinner. 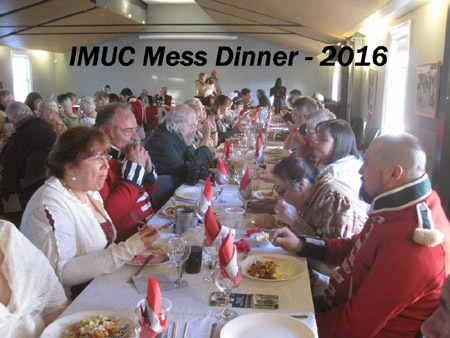 IMUC is about to begin it's 38th season! Our annual Mess at Fort York is a great way to start. IMUC hosted about 90 members of IMUC, IMAC and The Campfollowers along with guests from the 2nd York Militia, The Glengary Light Infantry, The Royal Newfoundland Regiment, The Royal Navy, The US 22nd,The Canadian Volunteer, The Light Dragoons, Our Loyal Sutlers, Our Native Allies and The Artillery! Lots of laughter, lots of reminiscing, a few tall tales and great food filled the evening! With more to be added! 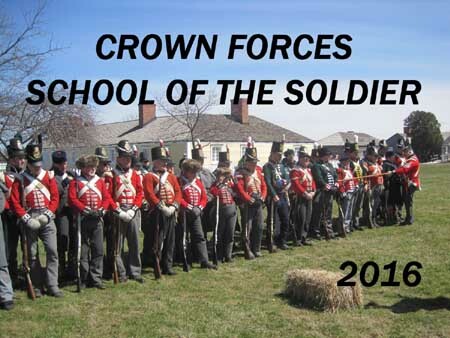 You can tell that spring has finally come to Ontario when the Incorporated Militia of Upper Canada heads to Old Fort York in Toronto for their Battle of York Drill Day! The weather was perfect, the members in a great mood and our CO put us all through our paces! The theme of the day was "getting rid of the cobwebs" from the line and from command. Being the Battle of York weekend, we were able to help the fort animate the site as well. As an organization we are expanding, initiating a new entity, IMAC ! We have added a set of blue jacked artillery under the auspices of Captain Brent Beacroft. The aim of IMAC is to fill in on gun crews that are short of trained members. While IMUC and IMAC were on the field and practicing on the fort cannon, the Campfollowers met and went over their plans for the upcoming season. In the center blockhouse IMUC members set up two static displays and engaged a good number of the public on site with discussions of equipment and tactics and the role of the company surgeon. Thanks to Matthew, Liz, Vlad and Jim we have a set of pictures as well.